The Memorial Day ceremony at the Leelanau Township Cemetery featured patriotic music, a history of the Gulf War and a flag ceremony with local Scout troops. At least 200 people gathered to honor veterans from a number of wars and nearly all branches of the military, among numerous community observances held around the region. 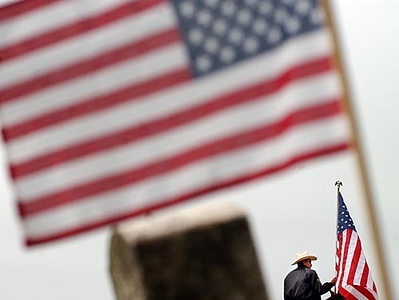 Bulmaro Moreno, a deputy with the Leelanau County Mounted Division, holds the American flag while sitting atop his quarter horse named Bandito prior to the start of Monday's Northport Community Memorial Day Service held at the Leelanau Township Cemetery.